I was browsing through my blog archives and stumbled upon a recipe for banana bread I posted back in March 2011. Perfect timing because I was having a banana bread craving and had completely forgotten about it. So, today I bring you banana bread that is made from pulling things from my pantry. 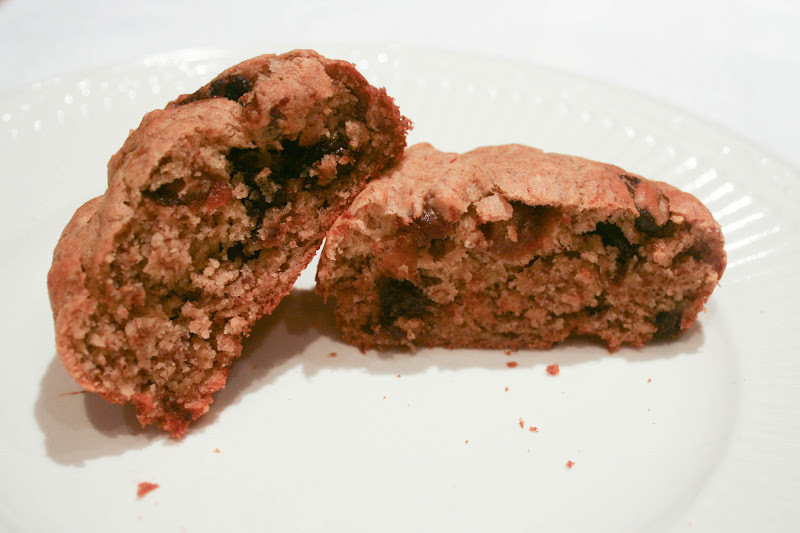 It's a healthier spin on typical banana bread with no sugar and 1/3 the amount of butter... but don't worry, it indulges in dates and a small amount of chocolate chips! The secret in not having to add sugar lies in using overripe bananas. Yes, the type that are so black on the outside they're actually a little horrifying to look at. 1/4 C chocolate chips In a large bowl, mash peeled overripe bananas. It's important that the bananas are overripe. If they are not, you may want to add 2/3 C sugar. Beat in the egg and add the butter and vanilla. Sift the dry ingredients together add to the bowl, and mix until smooth. Add the dates and chocolate chips. Pour the batter into a greased bread pan and bake for about an hour or until a toothpick inserted into the center comes out clean and the top is golden. Alternatively, use muffin pans and bake for about 25 minutes.